White ragworms have many different local names, such as whiteworms, whites, silvers and catworms, and are an effective bait if you can get it. They are prized by both match anglers and pleasure anglers, but their slow growth and infrequent spawning makes them vulnerable to over collecting, so research is currently being carried out to see if they can be farmed. 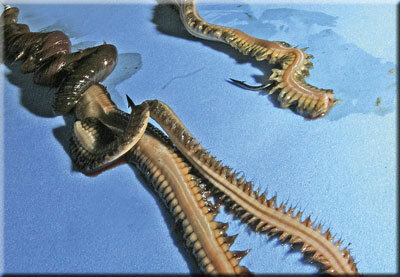 These worms actively swim and burrow, usually in clean sandy beaches or broken ground mixed with sand. They are long-lived, have separate sexes and can breed several times in a lifetime, unlike ragworms which breed once before dying. 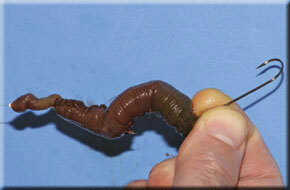 All mature worms in a local population will breed on the same day, but not always every year. The larvae drift around for several weeks among plankton before settling to the bottom. 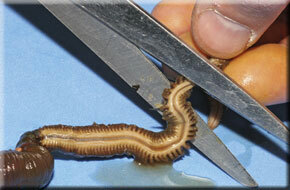 A three-inch worm may be five years old, and bigger specimens may be up to 12 years old. 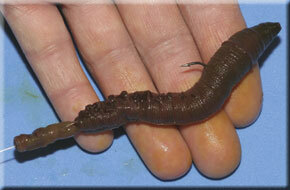 Most anglers who dig their own bait usually only come across an occasional bigger specimen by accident. They are rarely found in great numbers and it is unlikely that anyone could just go out and dig a bucket full. It is hard work to dig them in any great quantity. Best chance of finding them in any numbers will be along the lower shoreline during a big spring low tide. You will usually find them in areas where there are tubeworms and/or razorfish present because the white rag seem to prefer the same type of hard compact sandy ground that is found within sheltered estuaries and harbours. Unless you are lucky enough to find any washed up after a heavy sea, it is unlikely that there will be many along the more exposed sandy beaches where the upper beach is often a softer sand. However, if you look around for suitable local areas you should be able to collect perhaps 10 to 15 medium to large worms on a single tide. Remember that you will probably be restricted to just a few tides every year, weather permitting, when you can do this. The ones that I have found don't seem to be too deep and the traditional flat-tined potato fork would be more suitable for digging them than a spade. If you find a small local population, I would suggest that you keep the location to yourself. Because they are difficult to get, their use is very selective. Use them when the conditions are right for whatever species you are intending to catch or save them for an important match. They are the classic tipping-off bait for winter cod. A big rag and lug cocktail tipped with white rag is unbeatable. A crab and white rag cocktail will also produce cod and bass where other baits fail. They are also very effective when scratching about for smaller species in clear-water conditions, where flounders seem to find them irresistible. A few smaller white rag on a suitable- sized hook, perhaps with a few harbour rag or peeler crab claws, or a section of a bigger worm together with a bunch of harbour rag will soon get any reluctant fish feeding. They will often out-fish anything else in such conditions. As such they are a prized match bait, certainly worth their reputation as a fish-catcher and are almost worth their weight in gold. If you can find anyone or any tackle shop that sells them don't be surprised to pay a £1 each or even more for the bigger specimens. Whites are easy to keep alive in a cool fridge. As long as they are not overcrowded and kept cool they will be fine. Place them in a shallow tray, with a slight covering of water, and a bit of clean sand or fine sea coal, where they will keep sometimes for several months just by changing the water every few days.